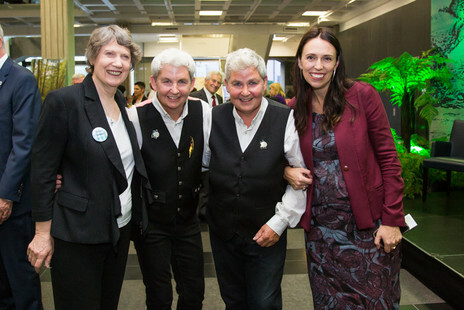 Dominating the large gathering were stalwarts of the many movements the pair have championed for 40 years: courageous campaigners for the rights of women, gays and lesbians, unions, and a nuclear-free New Zealand. The 2009 documentary Untouchable Girls was described as “the history of New Zealand in the time of the Topps” – and historians, archivists and activists were on hand to make sure it was recorded properly. Prime Minister Jacinda Ardern revealed in her speech that she won the Topps’ caravan in a TradeMe auction; she bought the TV prop to use as a mobile electoral office. The seller was anonymous, and Ardern won with a bid of $1400. She described going to Jools’s farm to pick it up, trying not to look like a townie, despite her high heels. Then the dilapidated caravan’s door fell off. 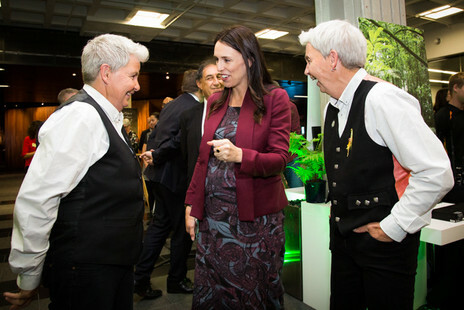 The Topps were touched by the presence of Ardern and Helen Clark. “It’s been great to feel the support of our women prime ministers,” said Jools in a heartfelt but typically teasing speech. “Well, almost all of them.” The mutual admiration didn’t stop Jools from demanding the banning of 1080 and better public television. 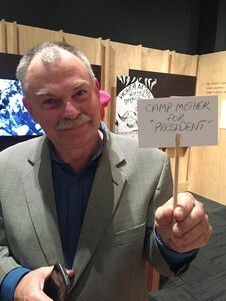 Later that evening, only a few metres away, in an exhibition marking 125 years of women’s suffrage in New Zealand, the Topps were shown the petition demanding that women get the vote. Among the signatures – in copperplate calligraphy – are two great aunts, Charlotte and Myrtle Topp. Earlier that day Jools and Lynda explained to AudioCulture that the political and the personal are inseparable in what they do, but so too is music. 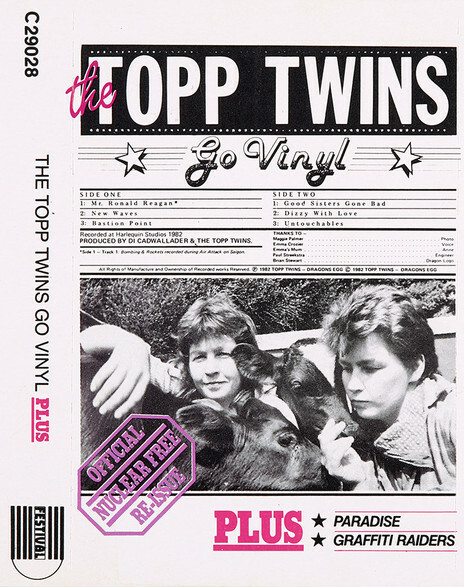 In the past couple of decades the widespread success of the Topps’ many television series have eclipsed the fact that, first and foremost, the sisters always were, and remain, a music act. 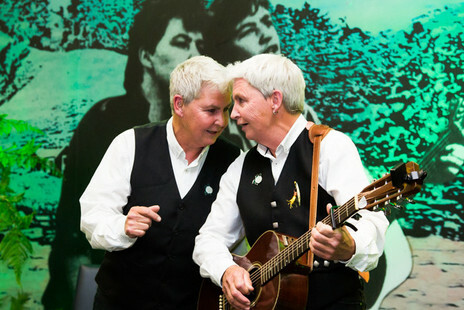 Their television alter egos Ken and Ken, Camp Leader and Camp Mother – and many others straight from an A&P show –have overshadowed their actual personae. Jools: “It did exactly what it said it was going to do on the front cover. Play in a Day. So I did. I learnt all the chords, in a day, and from that moment on I’ve never done any other thing with a guitar ever. I do play the guitar simply but I had a wonderful upbringing in the sense that I spent a lot of time down the back of the bus going home from Huntly College with the Māori kids in the back, where they would teach me the Māori strum. One of the Australian 78s inspired Lynda to take up yodelling: ‘Pinto Pony’ by June Holmes. “I went into a ‘yodel coma’ I call it, and I just thought I gotta learn how to do that. I was absolutely mesmerised by the sound.” So she started listening to the gramophone intently – “There was no musical teacher that could teach me yodelling” – and went down to the back of the farm to practise. In 1976, after leaving school, the Topps joined the Territorials. Their applications for the New Zealand Women’s Royal Army Corps are among the four metres of Topps papers held in the Alexander Turnbull Library. In answer to question 7B, “What should you take if you break something in the quarters?” Lynda writes, “Aspirin”. The examiner responds, “Very clever! But no marks”. The Topps were posted at the Burnham Military Camp near Christchurch for six weeks. 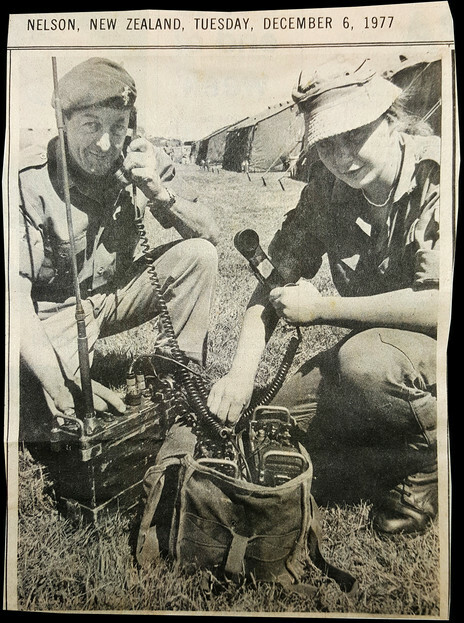 Lynda has described their stint in the army as, "Like a pyjama party ... with guns!" The Topps’ world at that stage was Christchurch – “We’d gone overseas” – and so they decided to “jump train” and stay there. They soon met a dynamic woman singer who held them spellbound: Nancy Kiel. Jools can’t recall ‘Tomboy’ without a guitar in her hand. “That wasn’t our lives,” says Jools, and Lynda elaborates: “We weren’t any of those things. And then it became that we were tomboys. And it was okay if you were a tomboy in New Zealand, because it means you grew up to be a lesbian! That was the idea of that song, it’s very interesting, it’s sorta country, and it’s got a very very [subversive] message. Lynda: “It’ll change, I’ll start off singing the melody line and Jools is doing the harmony and somewhere in the line of a song we’ll cross over and change. She’ll finish on the melody and I’ll finish off on the harmony. They feel a responsibility towards each other. The Topps’ first paid gig was in Christchurch, in a small coffee shop full of students wearing duffle coats and playing chess; the pay was $5 each and as many toasted sandwiches as they could eat. They played for four hours. Soon they got an offer from a larger café in Dunedin, the Governor’s Café, run by “two funky men who knew the student scene was going to be big,” says Jools. Shifting up to Auckland in the late 1970s took the Topps to another level, although they began by singing in the street for their supper. Vulcan Lane, off Queen Street, quickly became their domain: they drew massive lunchtime crowds and soon got mainstream media attention. A regular in the audience was on the staff of the Students’ Arts Council, then a very active events arm of the New Zealand University Students Association, running national tours, especially during Orientation. 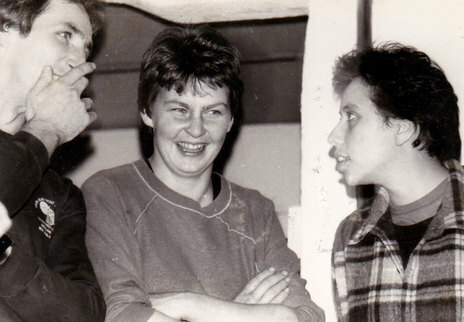 Right from the beginning their original songs had a political agenda; one of the earliest was ‘Graffiti Raiders’, which first appeared on the Web Women’s Collective compilation Out of the Corners (1982). For all that, though, there is great satisfaction knowing you have been involved in challenging many political and social taboos, and been vindicated by history. “We like to think that we helped the gay and lesbian community come out, that we make it easier for them,” says Lynda.